Mayo Clinic lung cancer patient Linda Wortman and her husband will attend next month's Super Bowl in Minneapolis. The couple was awarded the tickets after being a top fundraising team for lung cancer awareness. When the Minnesota Vikings win Super Bowl 52 in their home stadium next month (too soon to call? ), Vikings fans will be partying like it's 1999. Among them will be Mayo Clinic lung cancer patient Linda Wortman and her husband, Jerry. The Rochester Post-Bulletin reports the Wortmans scored a trip to the big game after being one of the top fundraising teams in this year's Team Draft Lung Cancer Survivors Super Bowl Challenge. 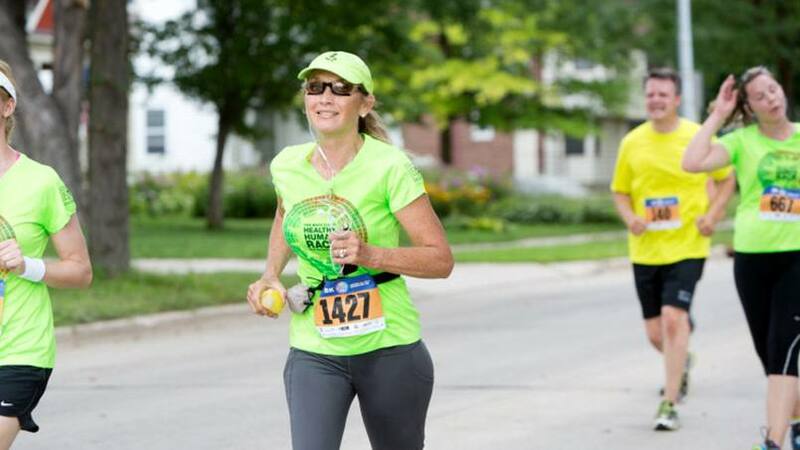 Linda's team, called "Run Like L," raised more than $50,000 during this year's challenge, which gives lung cancer survivors the opportunity to raise funds for public awareness and research. "This is a dream come true," Linda says in a story posted on the Team Draft website. And not just because of those coveted tickets. "For the past 10 years, it has been my goal to raise awareness of lung cancer. And now, by winning the Team Draft Lung Cancer Survivors Super Bowl Challenge, I feel it is possible!" Or, more possible. As we've reported in the past, Linda's endeavor toward that goal began when she received her own surprising lung cancer diagnosis. Doctors at Mayo Clinic found a small tumor in one of her lungs after a CT scan. Linda, who had never smoked a day in her life, was in shock and disbelief. "Doctor, you have the wrong person," she told the physician who delivered the news. "I never smoked." But as Linda would learn, it's not just smokers who are at risk of developing lung cancer. In fact, David Midthun, M.D., a lung specialist and pulmonologist at Mayo Clinic, tells the P-B that "10 percent to 15 percent" of all lung cancer patients don't smoke. "Anyone can get lung cancer," Dr. Midthun says. "If you have lungs, it's possible." What's not always possible, however, is catching the disease early due to the fact that our lungs, according to Dr. Midthun, are a "very silent organ." So silent that "around three-fourths of people with lung cancer don't show symptoms until the disease is already at an advanced stage," the paper reports. Dr. Midthun and others at Mayo Clinic are working hard to change that through Mayo's lung cancer screening program, "which uses low-dose CT scans to check high-risk patients — ages 55-80, usually — who smoke or smoked a pack a day for 30 years or two packs for 15." One of the most important factors, however, is making sure those who should be screened are taking advantage of the opportunity. Dr. Midthun points out to the P-B that "most of the people who are considered high-risk for lung cancer aren't getting screened." That is something Linda is trying to change. To that end, donations to her "Run Like L" Team Draft team "will remain open through the Super Bowl." Explore the resources of the Mayo Clinic Cancer Center.